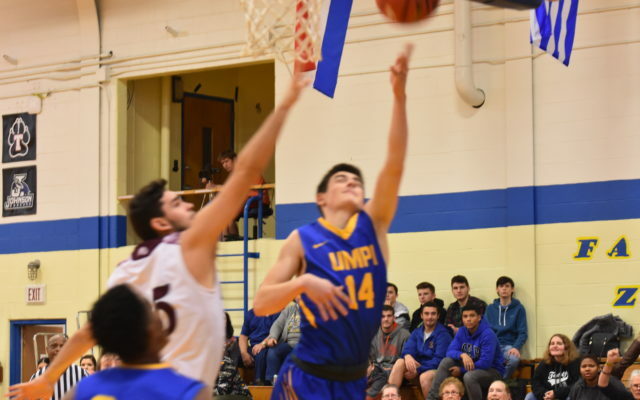 Griffin Guerrette, a freshman on the University of Maine at Presque Isle men’s basketball team, has been named Rookie of the Week in the North Atlantic Conference for the second time this season. PRESQUE ISLE, Maine — Griffin Guerrette, a freshman on the University of Maine at Presque Isle men’s basketball team, has been named Rookie of the Week in the North Atlantic Conference for the second time this season. Guerrette’s most recent honor came during the week ending Jan. 20. A graduate of Presque Isle High School and a former standout for the Wildcats under coach Terry Cummings, Guerrette turned in two outstanding games. He shot 56 percent from the floor, including 7-for-15 on 3-pointers and 5-for-5 from the foul line. On Jan. 16, Guerrette scored 25 points in an overtime win over Thomas College. In a Jan. 19 game against Maine Maritime, a two-point loss, Guerrette tallied 15 points and also grabbed five rebounds.